Hi everyone, this will be my first 2 stroke build, I currently build performance 4 stroke engines, mostly doing stupid head tricks... anyway, I'm looking for more power from the engine without going too overboard. It's a piston port with a pretty mild temper, I have no problem altering the port timing and sizes and building expansion chambers won't be hard for me, I am however, trying to find a reed valve I can adapt to it, the cylinder studs are pretty close together and I'd like to eliminate as much dead air between the piston port and reed valve as possible, anyone have suggestions? I heard yz85 valves might be a good fit, but I don't want to keep ordering different valves to finally find one that works. As you say, the 380 is a very mildly-tuned engine, relying on the heavy crank and modest porting for torque. From my own experience, just shaving the cylinder heads by 0.5mm / 20 thousands and fitting chambers makes a BIG difference to top-end power without affecting the sweet mid-range. The stock Suzuki pipes are as heavy as lead and only have flat baffles inside - no cones for resonance - so chambers make a BIG difference. I had 70s J&R chambers which are similar to Bassani pipes - long and relatively slim in the belly. I also cut the one-piece head into three individual heads, this totally cured annoying, persistent weeps from the head gaskets. One thing that is worth looking at is the exhaust port shape that Suzuki added to the GT250A and B models. They added supplemental exhaust ports either side of the main port, to speed up blow-down without risking the rings getting snagged. I've got some porting tips on my work PC which I'll post later. I found this post from an old friend of the board, Jay Mendoza, WAAAAYYYY back in 2000! The 380 has true pure Schnuerle porting with no auxiliaries or boosters and the ports are quite small in height and width. I got a great idea from examining my GT250 which basically had the same porting but with one major difference: the exhaust port had 2 small ports on either side near the top to effectively widen it without the risk of losing ring support. I know how to take a hint and drilled two 1/4 inch holes on either side of the 380's exhaust port, the tops of the holes being equal (in line, ed.) with the top of the exhaust port. Next, I used my Dremel and a carbide bit to drop the bottom of the new holes 3/4 of the way down towards the bottom of the (stock, ed.) exhaust port and slightly ovalled out the tops of the (new, ed.) holes. Next, I drilled two 3/8" holes in the piston skirt on the intake side, just on either side of the intake port, but so as not to fall in the ring gap area. Then using the Dremel I cut two troughs, or grooves if you will, in the cylinder walls that were even with the tops of the transfer(s) (ports, ed.) and the bottom of the grooves were even with the holes in the (piston, ed.) skirt at BDC. Basically I added 2 booster ports, angled right at the plug and widened the exhaust with webbed holes to support the ring(s). Next, I had the head milled to set the squish at .040" and went up 2 jet sizes on the main(s) (jets, ed. ), used Uni-Filter foam on the stock filter cages and repacked the silencers. Talk about a difference....It would do roll on wheelies in first...just snap the throttle open and enjoy the view of the sky ! The (stock, ed.) 380 would crap out at about 7K (rpm, ed. ), but this one would pull hard all the way to redline...and you didn't need to take it that far to get all the thrills you wanted. I got the booster idea, and drilling the holes in the skirt, from Aermacchis and RDs that I had seen back then. I never told anyone until now, as it was my big speed secret....and later I forgot about it all together. Now that I don't have the bike, I might as well tell everyone what I did. Thats a very useful piece of info. I might keep that in mind for further mods on my GT380 if I want a few more horses. Not quite sure I understand the bit about the troughs and the transfer ports completely though. He put grooves in the cylinder walls? What did they look like? Last edited by sportston on Thu Jun 28, 2018 12:24 pm, edited 1 time in total. It's a really good idea to mimic the exhaust porting on the GT250A/B cylinders, I think. Of course, it would be very hard to recreate the extra pair of transfer ports the later 250 cylinders have, but the boost port idea that Jay described will help a lot, as well as improving efficiency and piston cooling. Please see edited post. Can you explain further? I never saw photos of the mods (Jay didn't post any online) but yes, he milled shallow trenches in the cylinder walls the same width as the holes in the piston skirts, just above the inlet port and so the outside edge of each trench is where the outside edge of the inlet port is. I reckon a single 'boost port' would work just as well in the 380 cylinders, to be honest, and would be easier to machine. Pictures are too vague for me to see. Do you mean like this? The little port above the main intake port? 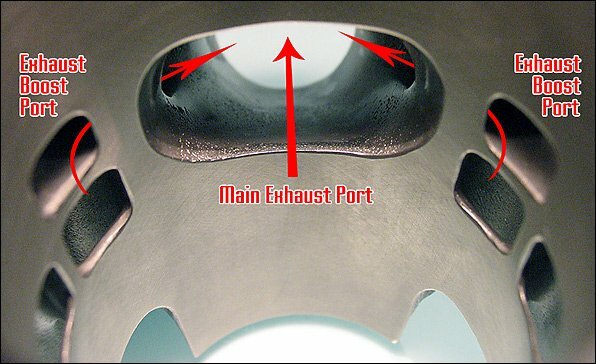 Not quite - your pictures show additional inlet ports which are revealed when the piston is high enough up the bore, that is, the port timing is completely controlled by the piston skirt. 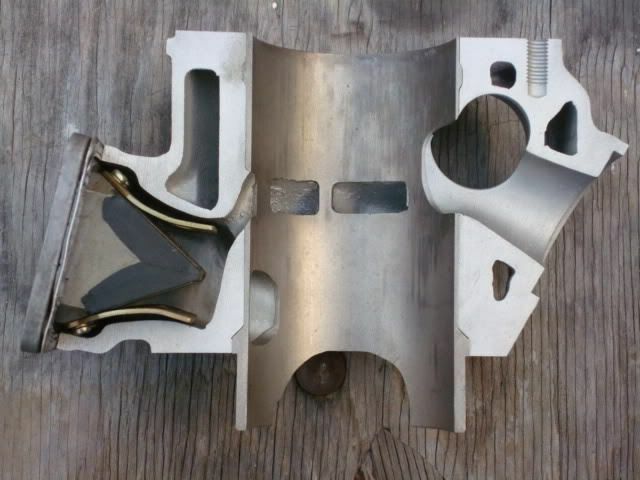 What Jay was talking about is shown in the image below, a slot or hole is cut in the piston skirt and it matches a shallow trench cut in the cylinder wall, the top of the trench is the same height as the top of the transfer ports. In a standard Suzi GT motor, a proportion of the fuel mixture is always trapped under the piston crown. This is inefficient and causes the piston to run hotter. The boost port acts like an extra transfer port to stop mixture getting trapped (and wasted) under the piston crown, and increases volumetric efficiency. It also keeps the piston cooler. 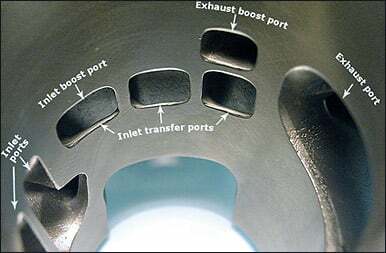 I suspect on the 380, the biggest impact in terms of BHP would be copying the GT250A/B auxiliary exhaust ports and milling a little (0.5mm) off the heads, as this will sharpen up the midrange and speed up exhaust blow-down. 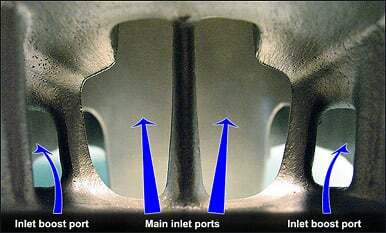 The inlet port is also relatively small and could easily be enlarged by a couple of mm. Ah I see! Interesting. Thanks for the clarification. I think the GT380 exhaust port has better potential and more like T250. If me I would widen and oval the exhaust port only. The 76/77 GT250 are shaped like this where as the GT380 EX port sides are square and narrow. If me I would not raised the stock +/-32mm exhaust height to match the 29.5 mm of the 76/77 gt250 or RD350. Too peaky. Instead use properly designed Chambers to help pull you a little higher in RPM. Actually, Jemcos for GT380 are decent here. My tune: Widen port 2-4mm and slope all the way to outlet. shape like later gt250A and up or Kaw triples etc. Taper edges and us very fine grit material to smoot/polish. Use 0.020" T250 gasket vs 0.040" stock for GT380, Jemco 3 into 3. Change to GT550 carbs/boots and remove metal at front of intake port on cylinder to match the 28mm carbs and slope down to liner. Taper liner into transfer ports at bottom like gt250. This will keep the low mid torque and boost mid to top end power and add another +1000 rpm of top end pulling power. Good stuff, thanks Vintageman! Just chambers alone really sharpens up a 380, I put a set of period J&Rs on my own bike and with no other changes, it would pull 6th gear in any conditions - up a gradient, into a wind etc, which a bone stock bike will not do. The J&Rs are similar to the Jemco design, with two-stage cones going into the belly of the pipe.